Places are still available on FORS Practitioner workshops 7- 9 in Lurgan throughout April and May. Book a place now for you and your transport team to make the most of this professional development opportunity. 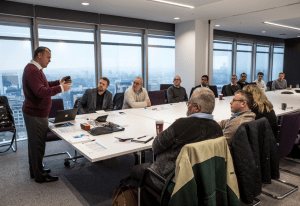 Designed to assist and develop transport professionals, FORS Practitioner is a series of ten workshops covering all aspects of fleet management. The workshops are open to all FORS members and can be attended individually, and in any order. A FORS Practitioner qualification, which is valid for five years, is awarded to those who attend all ten workshops in the series. The focus for the forthcoming workshops in Lurgan is on improving operational efficiency, reducing costs, and minimising environmental impacts. You can click on the link below for more information on each workshop, and to book as many places as you require for your team. Under ‘D4 Professional Development’ in the FORS Standard, fleet operators are required to identify and document the training needs of drivers and other staff involved in the fleet operation, as well as to implement a Professional Development Plan (PDP). FORS Practitioner is recommended professional development for all managers, trainers and supervisory staff. Though attendance to the workshops is not mandatory under FORS D4, it should be considered for inclusion in the PDP for relevant staff.